Dan Weijers Victoria University of Wellington June 2011. 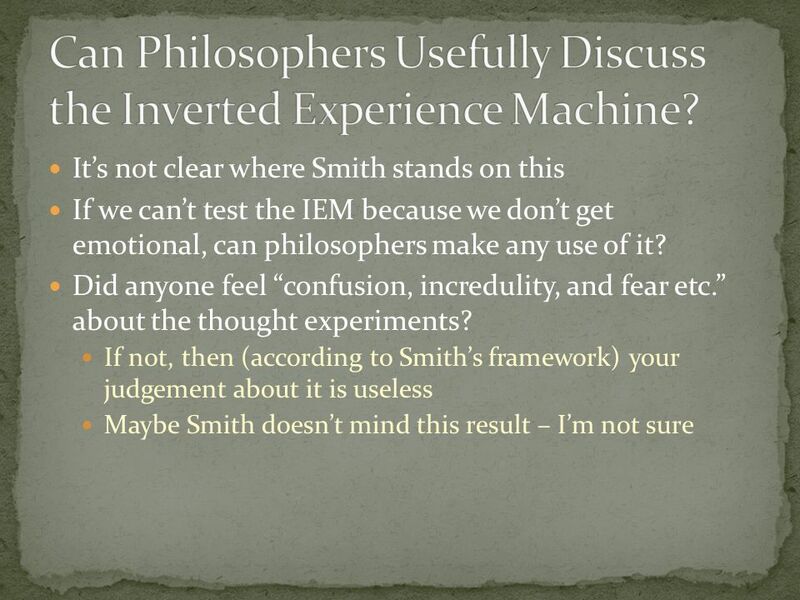 2 Lots of experimental philosophy is designed to test empirical premises like: We would not plug in Philosophers working in… experimental philosophy have begun… to collect data about folk intuitions Nahmias, E., et al. (2007). Surveying Freedom: Folk Intuitions about Free Will and Moral Responsibility, Philosophical Psychology, 18(5): 561. 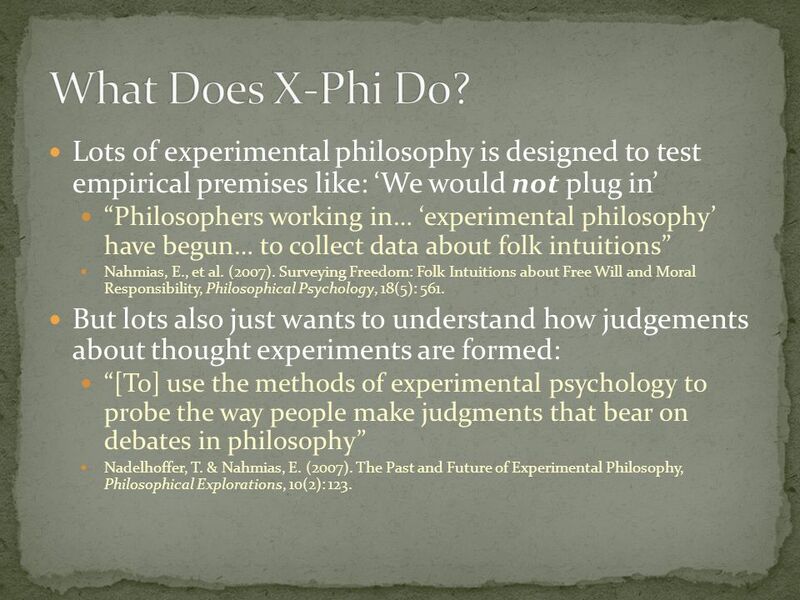 But lots also just wants to understand how judgements about thought experiments are formed: [To] use the methods of experimental psychology to probe the way people make judgments that bear on debates in philosophy Nadelhoffer, T. & Nahmias, E. (2007). 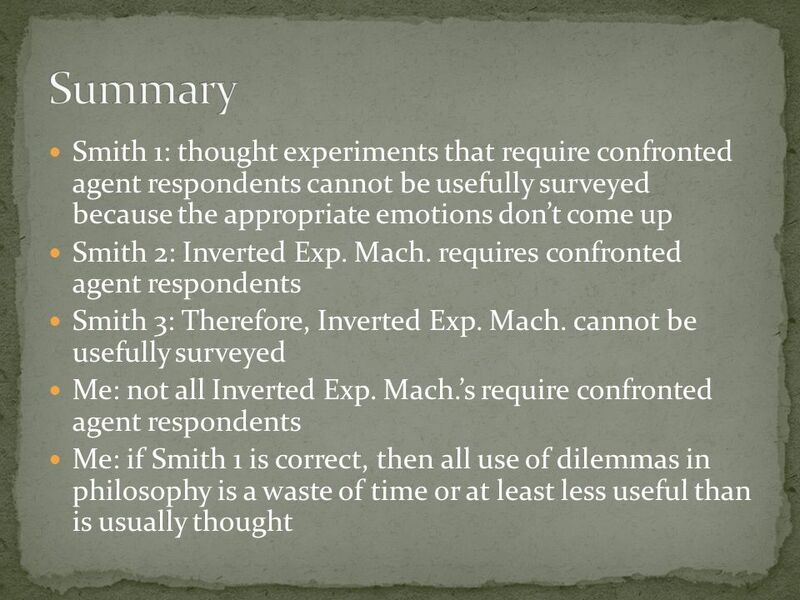 The Past and Future of Experimental Philosophy, Philosophical Explorations, 10(2): 123. 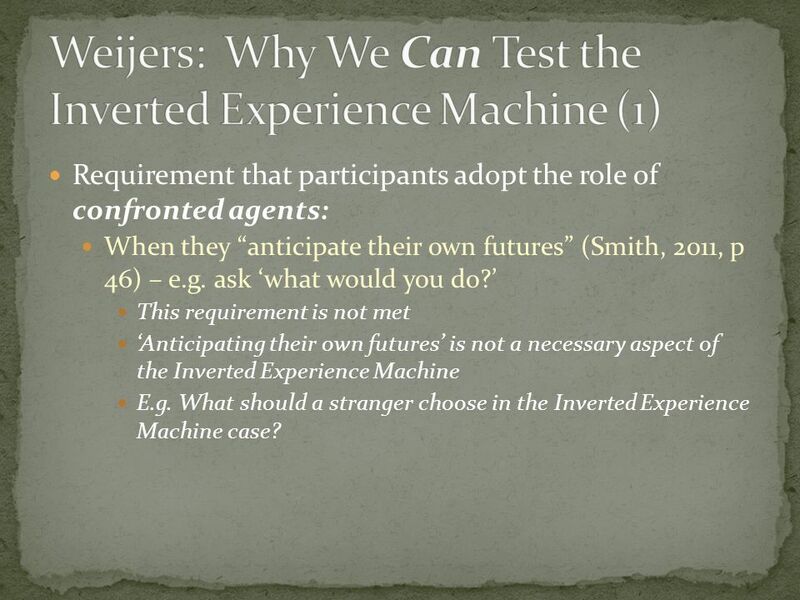 8 Requirement that participants adopt the role of confronted agents: When they anticipate their own futures (Smith, 2011, p 46) – e.g. ask what would you do? 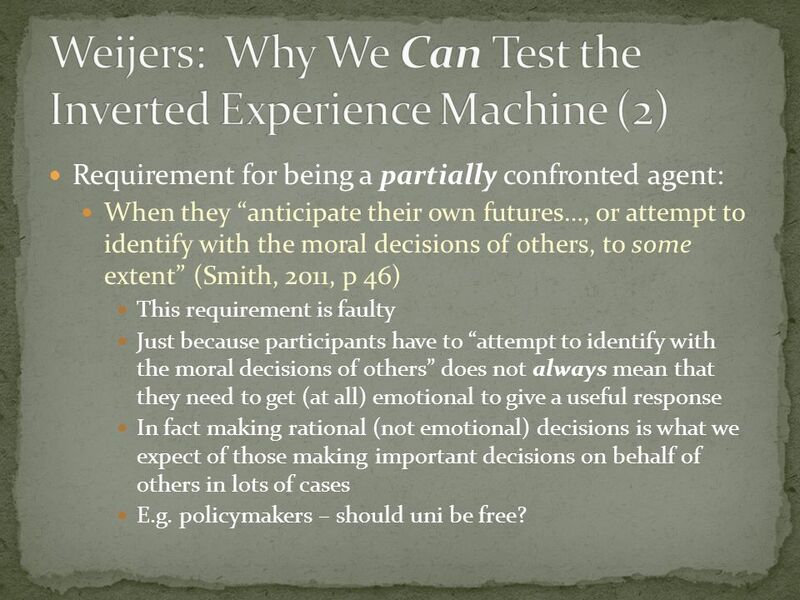 This requirement is not met Anticipating their own futures is not a necessary aspect of the Inverted Experience Machine E.g. 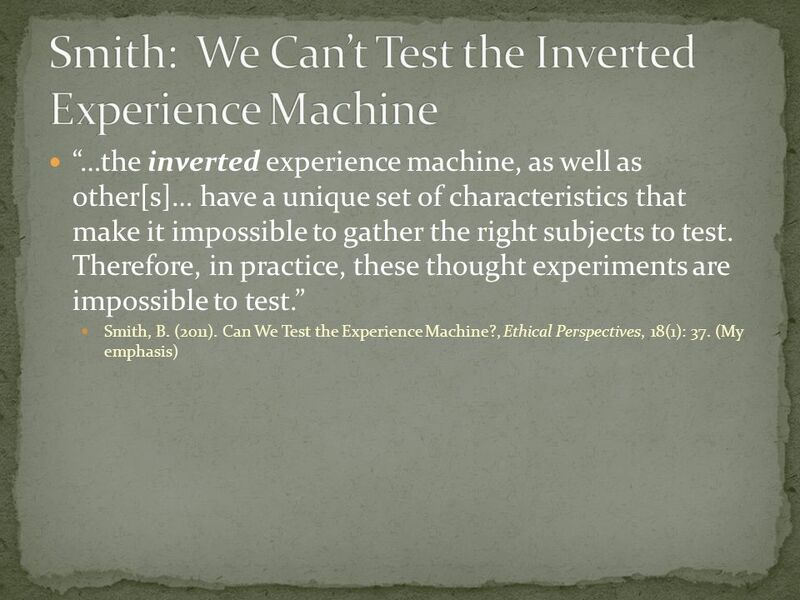 What should a stranger choose in the Inverted Experience Machine case? 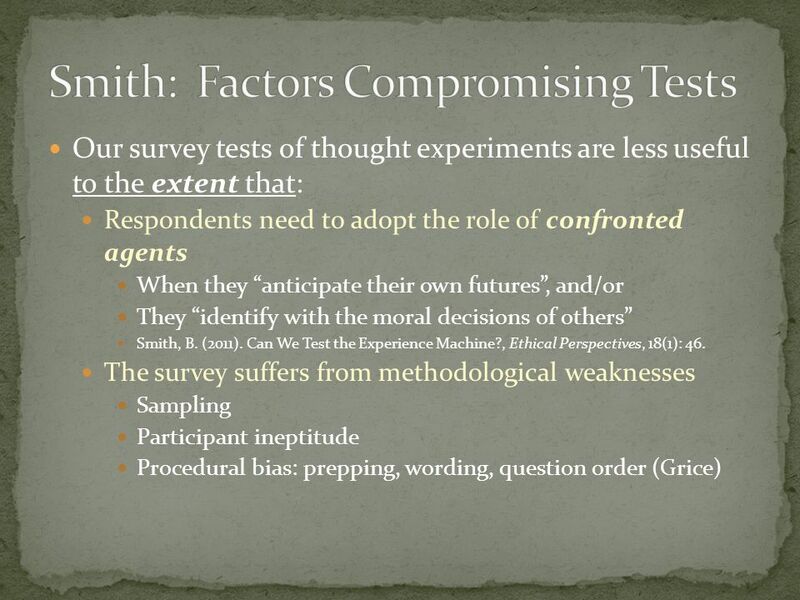 9 Requirement for being a partially confronted agent: When they anticipate their own futures…, or attempt to identify with the moral decisions of others, to some extent (Smith, 2011, p 46) This requirement is faulty Just because participants have to attempt to identify with the moral decisions of others does not always mean that they need to get (at all) emotional to give a useful response In fact making rational (not emotional) decisions is what we expect of those making important decisions on behalf of others in lots of cases E.g. policymakers – should uni be free? 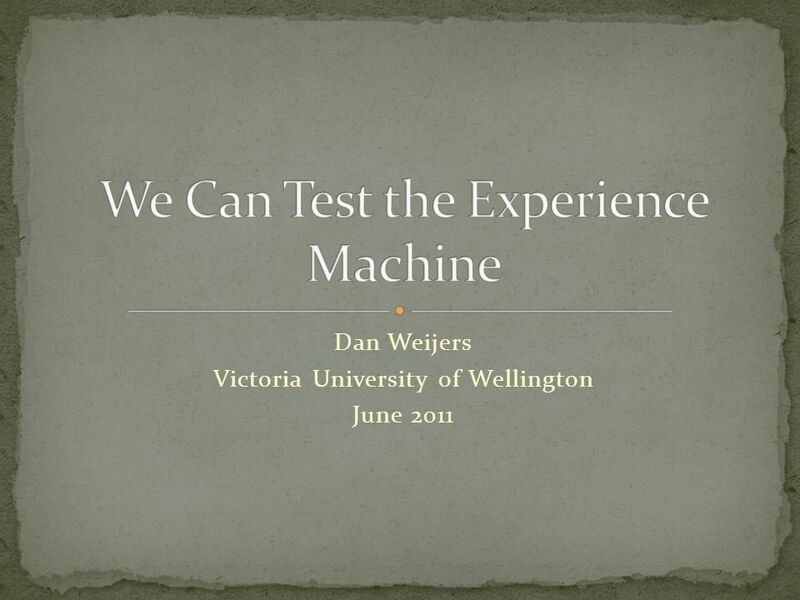 Download ppt "Dan Weijers Victoria University of Wellington June 2011." Moral Philosophy A2 How is knowledge of moral truth possible? 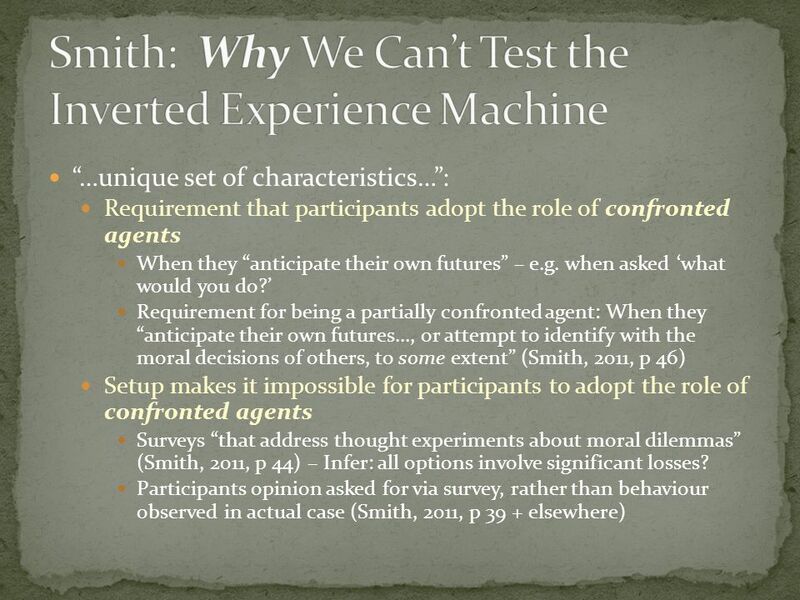 To what extent can moral truths motivate or justify action? Psychlotron.org.uk What makes science different from propaganda? 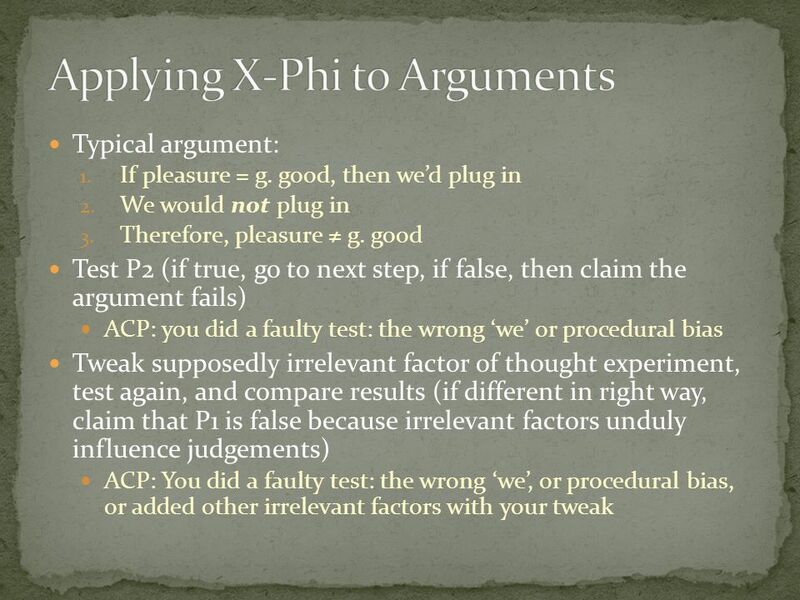 NOTE: CORRECTION TO SYLLABUS FOR ‘HUME ON CAUSATION’ WEEK 6 Mon May 2: Hume on inductive reasoning --Hume, Enquiry Concerning Human Understanding, section. Critical Thinking. 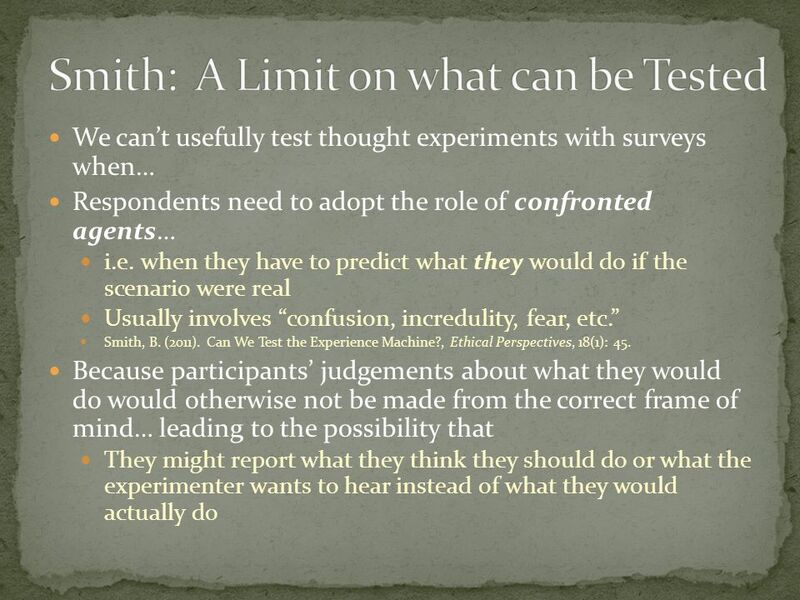 Definition: Evaluating whether we should be convinced that a claim is true or that an argument is good. It’s also about formulating. Philosophy 223 Relativism and Egoism. Remember This Slide? Ethical reflection on the dictates of morality can address these sorts of issues in at least. Introduction to Ethics Lecture 6 Ayer and Emotivism By David Kelsey. 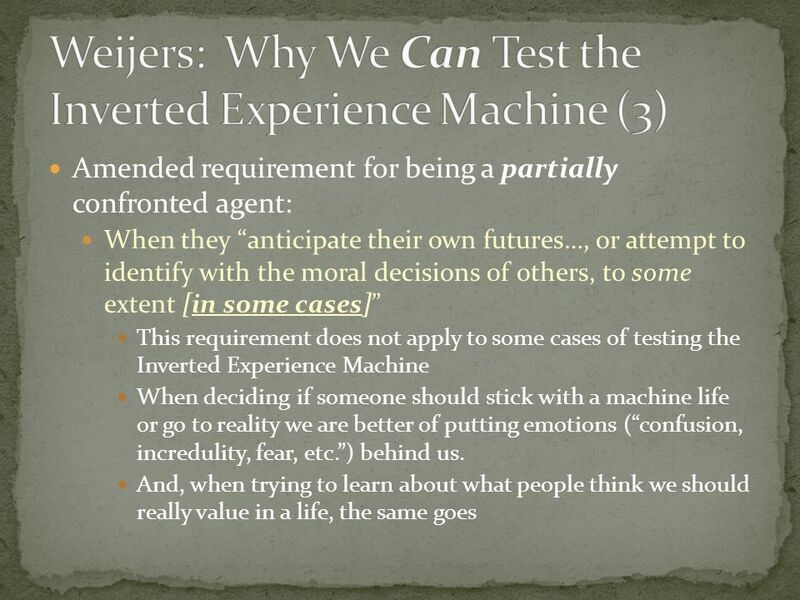 Eliminating Bias from the Experience Machine Thought Experiment Dan Weijers. Participating actively in decision making as a team and as an individual Investigating ways in which rights can compete and conflict, and understanding. Characteristics of Helpful, Non- threatening Feedback Psyc 4030.